DICHTER. is Plints Dutch poetrymagazine for kids aged 6 to 106. Each number ( four issues per year) contains almost 75 new poems by almost 30 poets. One illustrator gets to illustrate one issue. I was asked to illustrate the spring issue made in cooperation with De Domijnen in Sittard-Geleen (NL). There you can visit the expo ‘Tijdsbeelden’ (01/27/19 – 04/2819). Some pictures of objects shown in the expo can also be seen in DICHTER 11. Topped with a Stop:watch sauce of course. DICHTER. can be bought at Dutch bookstores or online at Plint. My dad was a true collector and I think I inherited that from him. In my studio I have this big wooden box in which I keep most of the stuff I find: branches, stones, shells, all sorts of things. Most of it is very common, but there’s just something about it I like. The shape of it, the colours. And then I have to take it with me. I made compositions with a few of those objects and I painted them on (found) pieces of wood. On instagram you’ll find my most recent work. In 2015 French publisher Le Diplodocus published my Stop:watch-book ‘Dans la rue’. In 2018 they asked me if I wanted to do a second book. And now, here it is! It’s called ‘Dans la ville’. For this book I made a roadtrip in March 2018 with our campervan through Belgium, France, Italy (where I also visited the Bologna Childrens’ Book Fair ), Switzerland and Germany. On the road I took lots of photos. A selection was used for ‘Dans la ville’. ‘Dans la ville’ can be ordered at le Diplodocus. They also made a fun video of the book which you can view here. Windowlicker is a vertical silkscreenproject and is initiated by the Cowboy Killers. 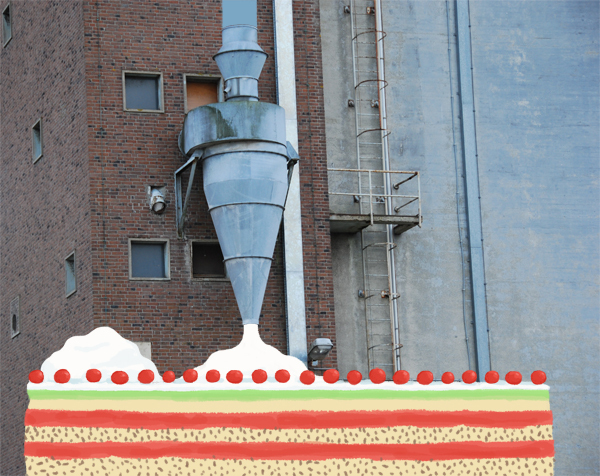 On the windows of twelve buildings in Leeuwarden screenprints were made by several artists, including Helehelena. We took photos of several objects in coffeecompany Blikspuit and used those to make a design. We printed them on the top windows of the company. Helehelena is also on instagram. Some new books have been published. I just counted all the books I illustrated and at the moment there are 123 books on my shelf. From left to right: Niet bijten! Stefan Boonen (uitg.Zwijsen), De dokter is kwijt, Bianca Antonissen (uitg.Personalia) and Dat mag niet weg! Annelie Ansingh (uitg.Zwijsen). I posted some illustrations from these books on my illustration page. In collaboration with Dutch publishing house Loopvis, Mara Piccione and I (aka Helehelena) designed and screenprinted a series of 3 limited edition notebooks. Get them here (€8,95 each and €24,50 for the set). April 14 – May 19 Shop Around presents in cooperation with Concerto and Record Store Day: ‘Vinylize’! Several illustrators and artists will create new artwork on top of an albumcover they picked for an expo at Concerto, Amsterdam. I picked this Lady Gaga album. Not really my cup of tea music-wise, but that pink hat just begged me to be turned into a pudding. Afterwards all covers will be put up for auction. The profits of that auction will go to The Ocean Cleanup. There are plans for a book that contains all albumcovers. The profits of the book will also go to the Leonard Cohen Stichting. Photography & Art Direction: Corriette Schoenaerts | Animation: Nina Spiering | Illustration: Tineke Meirink. The theme of the Dutch Week of the Children’s Book 2016 (de ‘Kinderboekenweek’ is an annual event to promote children’s books) is grandma’s and grandpa’s. Because of that a new Appie en opa book has been published by Gottmer publishing. For this I made twelve new illustrations. Rian Visser (the author of Appie en opa) also took care of the bookdesign and designed a nice bookdisplay. 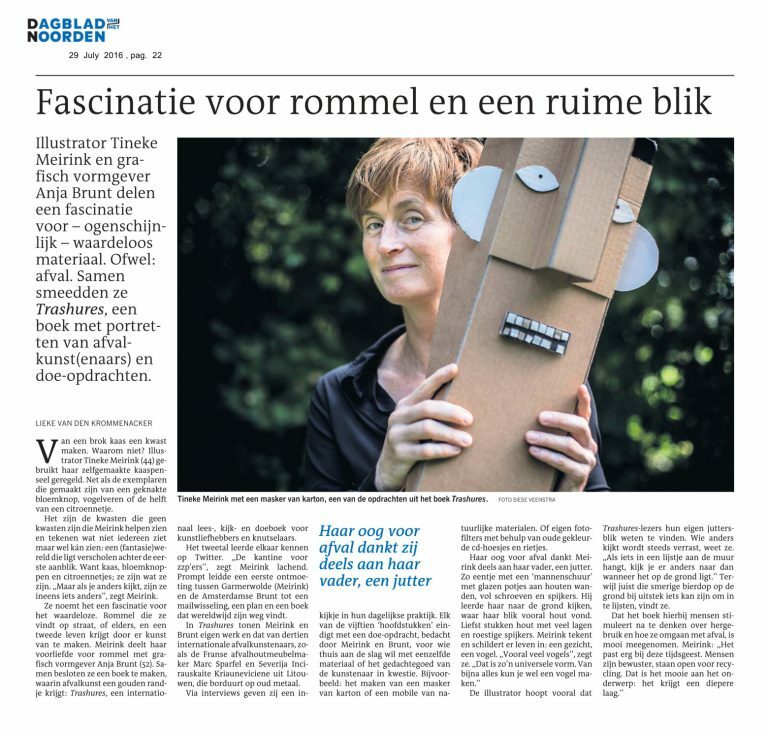 I got interviewed by Dutch newspaper Dagblad van het Noorden about Trashures. I’m sorry, the interview is in Dutch only. Earlier I wrote about Trashures and how it all started. Now I can officially announce the book is in stores! And already spotted in the Stedelijk Museum shop in Amsterdam this week. Online you can order it here. At the end of August there wioll be an official booklaunch at ABC Books (Spui)in Amsterdam. Please check our Facebook-page for the latest news. The day Anja Brunt mails me by accident (september 2014) is in fact the day the idea for Trashures is born. We start mailing back and forth and the same day we decide to start a project together. We don’t know each other too well, but we do have some things in common. We both like stuff on the street, things we find during our walks, objects of no value or use that we can re-use in our work. We decide to focus on these things. The idea is to design a book in which we show the work of artists who work with ‘useless’ materials. We combine it with DIY projects inspired by the work shown. The projects’ name Trashures (a mix of ‘Trash’ and ‘Treasures’) is soon found. And after we partner up with BIS Publishers it’s official! We start looking for artists worldwide and we collect loads of DIY ideas. Because this project is something we do besides our regular jobs as designer and illustrator there are times during the process of making the book that things slow down and not much is happening. But now, after one and a half year, we can say the job is almost done! The artists have been selected, we received all images, took care of the DIY projects, all texts have been written (and rewritten) and the lay-out is nearly finished. In ten days the book will go to the printer and it will be published next month. Exciting! Featuring: Mari Andrews, Sarah Bridgland, Anja Brunt, Gerard Collas, Alice Fox, Studio Fludd, Severija Inčirauskaitė-Kriaunevičienė, Maartje Jaquet, Richard and Judith Lang, Tineke Meirink, Nana Rosenørn Holland Bastrup, Slumbird, Marc Sparfel, Anna Taratiel en Natasha Tastachova. And illustrations (stamps) by Gertie Jaquet. Hello and how nice of you to drop by at my new website! Let me show you around so you’ll know where things are. This new website is a combination of the former tinekemeirink.nl (just illustration) and stop-watch.nl (my photo/illustration project). I added another project called ‘worn wood’ and I’m sure new projects will follow. You can read more about me at the bio page and the latest news can be read on the blog, which also is the homepage. Please feel free to contact me if you have something to ask or if you just want to say hi. Hope you’ll enjoy the work. A lot of fathers in The Netherlands don’t read bedtime stories. That is a shame because research shows it increases children’s vocabularies by 1000 words every year. But, as you may remember yourself, many fathers make up stories before bedtime. So CPNB gives fathers the chance to turn these made up stories into a book. Famous Dutch author Jacques Vriens turnes the best made up story into a real bedtime story. Making Dutch dads read more to their children. For this campaign I worked wih Lemz. I took care of designing the images. Today my book ‘Dans la rue’ hit the French bookstores! It is published by the young French publisher ‘Le Diplodocus’. The book stimulates ‘young kids (and probably also adults) imagination by looking at the world around them in a different way. It is based on my project ‘Stop:watch’. I am so thrilled and I absolutely love the look and feel of the book! 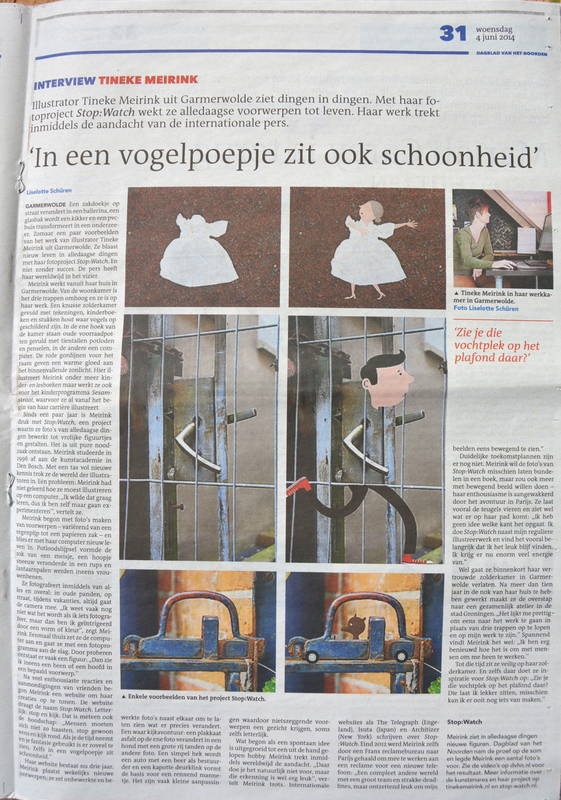 Today an interview in local newspaper ‘Dagblad van het Noorden’ is published. You do have to register, but it’s for free. And if you do you’ll get a nice bonus! You’ll get to see two short films in which you see me illustrating some photos the journalist brought with her. Here and here. See for yourself if I succeeded. (I’m sorry it is only available in Dutch). Hip hip hooray! Stop:watch is 3 years online! As you might know, Stop:watch is an ongoing project by me, Tineke. Let me tell you how it all started. It originally starts off as a joke. I already painted (and I still do) on worn wood, using old nails, stains and stuff on the wood in the image I paint. To practice my digital skills I decide to do the same thing on photos in Photoshop (instead of paint on wood). I take pictures of rubbish, stains, irregularities and draw on them digitally. A crack in the wall turns into stairs, a dirty tissue suddenly is a ballerina. The apparently uninteresting images get a whole new meaning by the illustration added. They come to life. I post them on Twitter. After many nice comments I start a blog in april 2011 with the impossible name itsjustmorefunwhenyoutakeacloserlook.blogspot.com, later changed to www.tinekemeirink.nl. Now, 3 years later, Stop:watch is more than a joke. Worldwide people write about it (read it all here), for Dutch Noorderzon Performing Arts Festival an app is made, a memorygame ‘Can You See What I See’ is published (by BiS Publishers) and in november 2012 I work on a campagne for Samsung France in Paris. I post the original photo and the illustrated one. So you can see what I see. And I hope it makes you realize that there is beauty and inspiration everywhere. In a door handle, in a chimney, even in dog pooh. If you just take the time to take a closer look (maybe in case of dog pooh not too close) you’ll have so much fun. Because of the 3 year anniversary a new website is launched today, the 15th of April. And you also will get nice extra’s when you order something in the shop (15-25 April). I thank you all very much for taking the time to take a closer look at my work all these years. Hope to stay in touch. XTineke. 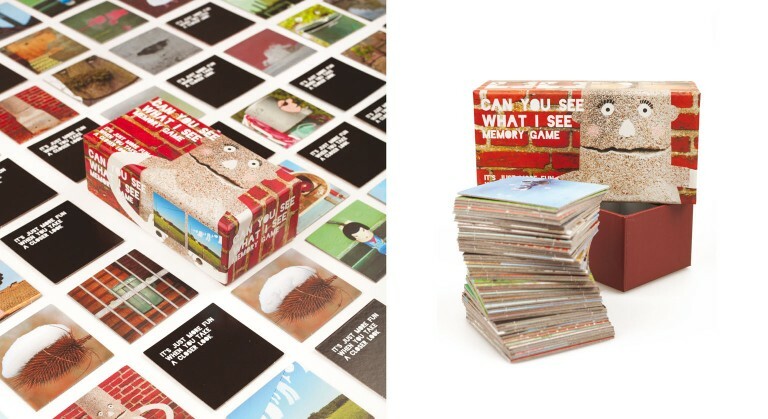 I’m very pleased to tell you that there is a reprint available of the Memorygame ‘Can You See What I See’! It’s got a brand new coverdesign by Lilian van Dongen Torman which I’m very pleased with. You can order it (€15) from any country via BIS Publishers. If you like you can take a closer look here.